Richard Klein knows desperation all too well. When the AIDS epidemic of the 1980s and 90s swept across the nation, the former director of the US Food and Drug Administration (FDA) Patient Liaison Program could only watch as desperation slowly swallowed entire families, neighborhoods and cities. Antiretroviral therapies hadn’t yet reached the market, so infected patients saw the virus as a death sentence. With their backs against a wall, the FDA and thousands of victims scratched and clawed for anything that might slow the cresting wave. He recalls patients turning to hyperbaric chambers and injection therapies loaded with “goat serum.” He remembers hearing news that at least one person had died on a freezing table during a whole-body hyperthermia procedure. Holistic cures that sound like mad-lib suggestions (ozone therapy, coffee enemas, energized water) were embraced openly. After all, what did the victims have to lose? Klein knew then what he still says now: pseudoscientific solutions are only attractive when real solutions are absent. No one had anything more than anecdotal evidence to suggest their unapproved therapies were beneficial, and most only had hearsay from friends or other patients. But even if these solutions didn’t work, many of the victims of the AIDS epidemic weren’t necessarily searching for a cure, Klein said. All they wanted was to keep trying—they were looking for hope. This question—one that dances on the fine line between human rights, the role of government, and the sanctity of life—has been gaining momentum in the US. It’s spurred a state-by-state wave of trending legislation called “right-to-try” laws aimed at giving terminally ill patients the right to try experimental therapies that have completed phase 1 testing, but have not been approved by the FDA. As supporting politicians and agencies call for their recognition on a federal level, those in opposition have raised questions about their clinical merits. The FDA’s Expanded Access program (informally called the “Compassionate Use” program) has been providing a pathway for terminally ill patients to access investigational drugs, biologics, and medical devices since 1987. According to its website, the program approves 99% of submitted requests, with emergency requests often being approved in real-time via telephone. Still, right-to-try laws, as formulated and driven by the libertarian think-tank Goldwater Institute in Phoenix, AZ, persist. Forms of its legislation have already been passed in 39 states, as well as in the House of Representatives and Senate. The House and Senate have each passed their own versions of the bill, but the Senate was unable to pass the House version in a vote taken in March. Congressional approval is the final hurdle for the legislation, as President Trump has been a vocal supporter of right-to-try legislation at the national level and is likely to sign a bill that reaches his desk. Policy makers insist they’re not supplanting the FDA, nor undermining its efforts. Rather, they’re fighting for what they believe are human rights. Goldwater senior policy advisor Starlee Coleman has very specific criticisms regarding the FDA’s Expanded Access program. In an interview with MD Magazine, she argued that even a consciously streamlined version of the program would be burdensome to physicians who are trying to help dying patients. The application also requires independent institutional review board approval, which, unless the physician practices at an institution with a review board, can be lengthy and unfriendly to patient timelines. But Coleman’s biggest criticism is staunchly libertarian: she doesn’t believe patients should have to file an application with the federal government to attain a potentially life-saving therapy. “The FDA could and should continue to streamline their process, and physicians should educate people on the program’s existence and work with them towards making it more useful, but that still doesn’t overcome our objection that, as Americans, we have rights to medical intervention,” Coleman said. The broad concept of right-to-try laws is that the final decision on therapy access for the patient falls on the drug maker — and the companies are not obligated to participate if they don’t want to, Coleman said. She understands why pharmaceutical companies have objected to providing experimental therapies: their resources may not allow for clinical trials, patients may not be fit for treatment, or the treatment still might be considered unsafe for use. Since its first implementation at the state level over 2 years ago, right-to-try successes and failures have been understood anecdotally, if at all. Coleman has heard about a Florida-based physician who treated a woman under the state bill, as well as another doctor in Oregon. The most notable champion of the law has been Ebrahim S. Delbassand, MD, an oncologist based in Houston, TX. By Coleman’s count, Delbassand has treated about 180 patients under the Texas right-to-try law. Its current role as a small, infrequent contributor to experimental therapy access may be all that comes of the right-to-try movement. Coleman insists there’s no intention to replace the Expanded Access program. If anything, she hopes smarter policies will be adopted by the program in response to the movement. Some physicians question whether improvements on the current program are even necessary. For more than 50 years, the FDA has been entrusted with approving medical treatments that have been proven safe and effective through rigorous trials. In 1962, the Kefauver Harris Amendment began requiring that drug manufacturers establish proof of a drug’s safety and efficacy before securing FDA approval. The amendment was introduced after women in Canada, Africa, and Europe gave birth to babies with severe birth defects after taking thalidomide, a drug marketed as a treatment for morning sickness. The thalidomide tragedy largely spared the US because of Frances Oldham Kelsey, MD, PhD, a then-FDA reviewer who resisted pressure from the manufacturer to quickly approve the drug. She insisted that the company test the drug thoroughly before granting approval, even though it was already approved in several other countries. If the FDA stands by its goal to protect Americans from false claims of efficacy, untested products, and unsafe products, many worry that circumventing the administration through right-to-try legislation will erode the regulatory role of the agency, and put patients at risk. In a statement before the Senate Committee on Homeland Security and Government Affairs, Peter Lurie, MD, MPH, Associate Commissioner for Public Health Strategy and Analysis at the FDA, emphasized that whenever possible, patients should participate in clinical trials to access experimental drugs. These trials protect patients and generate data that could lead the FDA to approve the product for widespread use. Though the decision often ends with them, some pharmaceutical companies have reported they would continue to seek FDA permission, even if a right-to-try bill becomes law, the New York Times reported. The anecdotal success stories from physicians like Delbassand — bound to be amplified by media coverage and Trump’s continued endorsement — scares Alison Bateman-House, PhD, MPH, MA. Bateman-House, of the Division of Medical Ethics at NYU Langone Health, is concerned patients will believe they have access to investigational drugs that they are unlikely get their hands on. She agreed with Coleman; the gatekeeper to experimental drug access is the pharmaceutical company. But that makes all the difference. Bateman-House recalled another right-to-try story — one that flew under the public radar — to MD Magazine. After Missouri became the third state to pass the law in May 2015, a man diagnosed with amyotrophic lateral sclerosis (ALS) moved his entire life and family to St. Louis to receive access to a highly coveted experimental therapy. To his dismay, the pharmaceutical company never cleared him for clinical trials. “But Goldwater’s assertion is the reason patients don’t get access to investigatory drugs is because the FDA either rejects the application, or it’s too late for the patient,” Bateman-House said. “There’s no reason for the right-to-try law,” because the legislation movement is really an effort to limit FDA authority on drug regulation — with public sympathy for the patients serving as an easy driver. Klein echoed her criticism of the movement, suggesting there are no real problems the right-to-try laws “point out and try to solve.” He added that the suggestion that physicians are burdened by the Expanded Access program application is insincere; most doctors he has spoken to are more than happy to take on such a task for an in-need patient. 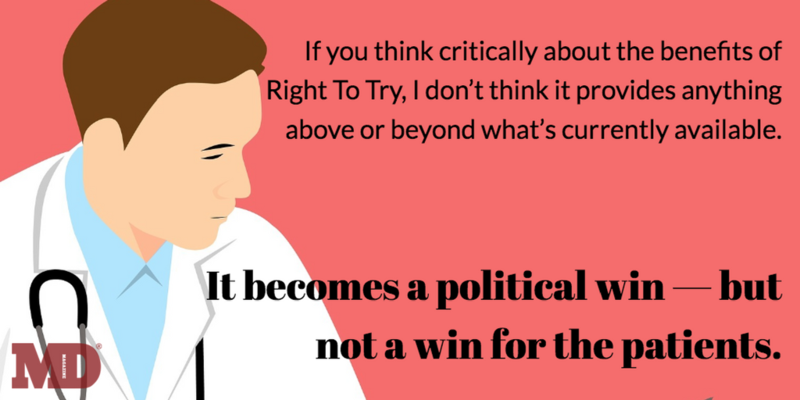 “If you think critically about the benefits of right-to-try, I don’t think it provides anything above or beyond what’s currently available. It becomes a political win — but not a win for the patients,” Klein said. Similar to the earliest HIV/AIDS cases, patients driven to the policy are often driven by overhyped promises. The most recent investigative breakthrough for a disease is usually humbled by the middling results of clinical trials. At best, it incrementally improves on the current market of therapies. At worst, it is ineffective, intolerable, and unsafe. Klein noted there’s also misconception as to the success of certain experimental therapies for certain conditions. While fields like infectious disease have a positive track record with experimental drugs because they often yield binary results, others like oncology struggle to find therapies that don’t include widely varied patient outcomes. Cancer pharmaceutical companies — especially those that are smaller in stature and from a technology background — frequently don’t have the capability or confidence to run such clinical programs. Physicians often have to bear the news that most of the drugs involved in expanded access scenarios don’t have such benefits. Right-to-try laws often become a point of tension because they are characterized by their lack of evidence. Decisions about whether or not there’s merit to the idea that a dying patient should have the right to try a potentially dangerous—or lifesaving—drug are often bounced around by patients in states of desperation and others, who may not understand how intense that state can be. To add on, some of the right-to-try laws set in US states contain provision that could potentially deny access to hospice care and health insurance benefits to those who submit to investigative clinical trials, Bateman-House said. She maintains that physicians know what’s best for patients considering such a venture, and understands her opposition feels similarly. Right-to-try laws are built on the notion that clinical power needs to be transferred from federal agencies back to physicians, she said, but many physicians would disagree with that shift of responsibility. It should be the role of the physician to help patients better understand the risks and benefits of investigative therapies, while also keeping patients aware of the cost of care. Klein expressed concern for patients that get caught up in false hope by doctors who turn a profit from perpetuating treatment past the point of return. Patients and their loved ones are often well-versed on the details of an investigative drug before speaking with a physician, he said, because they frequently research therapies out of desperation. While it’s pragmatism that frames the FDA’s approach to expanded access, it’s hope that drives the growth of the right-to-try policy. Klein knows there are worse reasons to pursue a miracle drug — and worse options for miracle drugs, too. His concern lies in what policy makers will do with that hope.